Greek restaurants: your local favorites? I need your help again. In advance of next month’s restaurant roundup, I’m preparing to compile a list of Greek restaurant favorites — mine, and yours. I’ll consider everything from the corner gyro joint to your Greek diner hangout to the sit-down-dinner place where you can lift a glass of retsina and say, “Here’s looking at you, squid!” So, what’s the word? Where in the Greater Seattle area do you go for Greek food, and once there, what’s the dish (or dishes) you wouldn’t want me to miss? 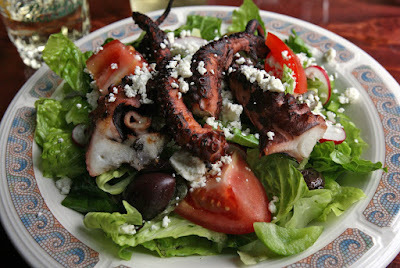 I’d like to get my arms around this: Octopodi Salata at Plaka Estiatorio in Ballard.